To commemorate the (almost) never-to-be-seen-again confluence of the first day of Hanukkah and American Thanksgiving, Thanksgivukkah, Formlabs design-engineer Sivan printed&hellip;the turknorah! Menurkey? 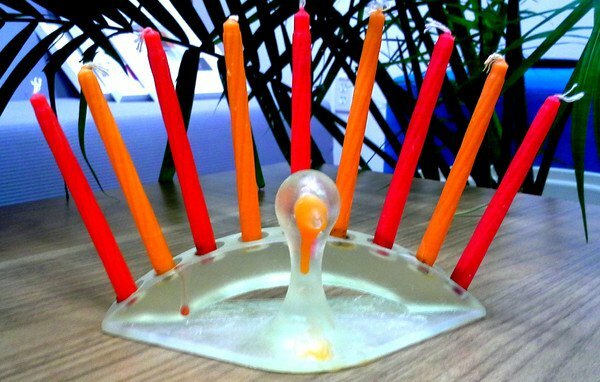 Whatever mashup name you’d like to give it, the turkey menorah is undeniably festive. It’s a holiday for us in the US, so for this post, we’re going to kick back and let you do the work. Which is to say, we’re going to show off the great prints you’ve been posting in the forums — there’s been a lot! Colus’s elephant head sculpt shines after a thorough finishing. Zac Wollons’s walking robots are ready to march. Alex Friderici didn’t let twenty-four hours pass after Smithsonian X 3D opened their model archives for public perusal — he modified a mammoth skeleton so it’s primed to print on a Form 1. The Laser Cowboys at Smithsonian X 3D were super impressed! Luca Perencin at NoLabs posted a great time-lapse video of a five-hour build. We’ve got an exciting couple of weeks ahead. Next week we’re going to be visiting Euromold 2013; Frankfurt locals, come say hello in Hall 11.0 / Stand FN02a, in the Digimold section. For an upcoming roster events, see here: upcoming Formlabs events. Happy Thanksgiving to our US supporters, Happy Hanukkah for all those celebrating, and to everyone else, have a great Thursday. Keep posting your prints! Let us know if you have any questions, and if you come up with a better name for the menorah turkey, share in the comments. We'll have some updates for you on our shipping and Kickstarter status next week — as well as some other exciting announcements — so stay tuned.